Since I first set foot back in the classroom over 20 years ago I have been arguing the need for a professional body for teachers. I summarised this view here. Without such a body teachers lack independence when they require it and they lack a voice where we need to hear it. Today the DfE launched a consultation around the issue of a College of Teachers, a professional body for the profession. There are contradictions and a degree of fuzziness in the proposals which make them, in my view, unsatisfactory. They underlined the ‘must’, not me. However, this intention is undermined by the call later for interested organisations to express their interest in the running of the CoT. Oh, I’m sure they’ll ‘involve’ teachers. An expert group here, a sub-committee there. Maybe even a couple of ennobled head teachers on the board of trustees (sorry, is my chip showing?). And lots of ex-teachers (whom I have nothing against, being one myself). But you can bet your bottom dollar that it wont be an organisation of current classroom teachers who are asked to take on the role. “Too hard”, “How would they get the time out of the classroom”, “How would they be selected”, “They don’t have the experience”. I will be printing a “Why we can’t involve real teachers” buzzword bingo card in a later post. The other issue is what it is actually proposed the CoT be about. Here, the consultation is less than clear, going out of its way to say “don’t expect too much”. 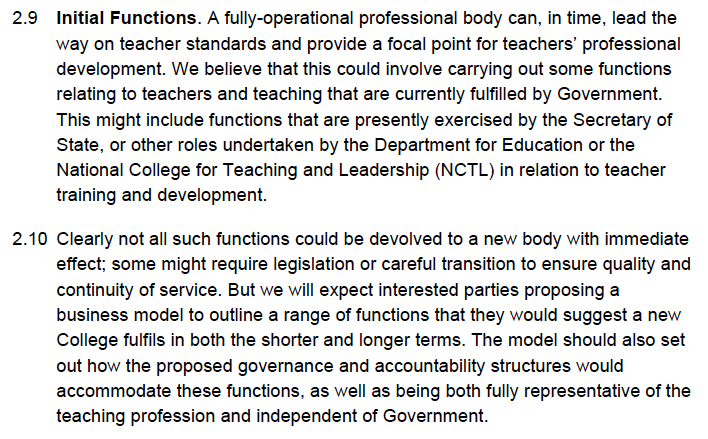 The consultation gives some heavy hints as to exactly what it is that DfE expects the CoT to be about. This can be seen as helpful, but it does also undermine the independence of the body by telling it in advance what it is for. Surely that’s for the membership to decide? It then goes on to ‘suggest’ how this should be done, using its preferred route of teaching schools. It further goes on the detail an online platform that it intends to facilitate and hand over to the CoT at some unspecified date in the future. I wonder who will get the contract to re-invent that particular wheel? It is also important to stress that the consultation itself, i.e. 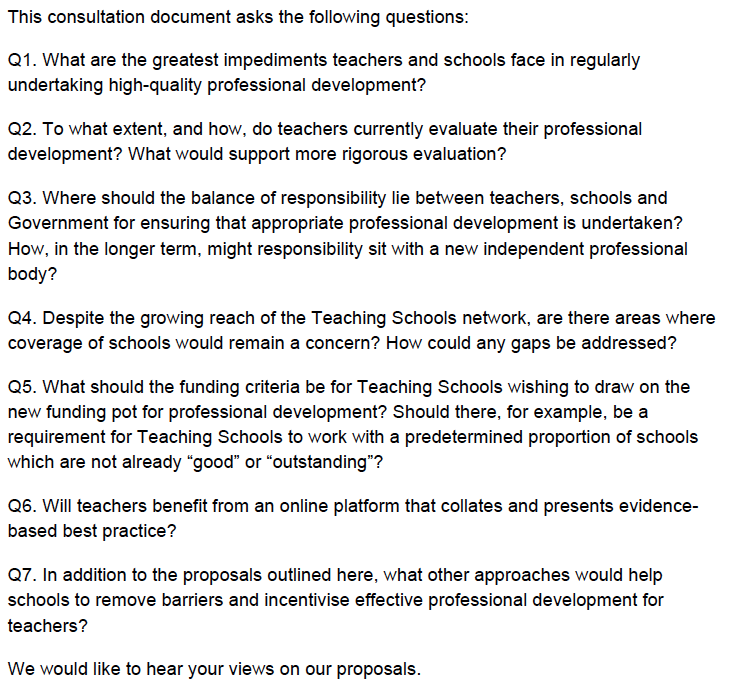 the bit it is asking for responses to, is not so much about the CoT itself (that appears to be left to those organisations who will be bidding to run it) but about CPD and professional development. Taken together this does make me quite wary that what is being proposed here is a DfE approved and funded CPD clearing house. Which is not really the same as a Professional Body for teachers. Many elements I would keep the same, just do them in a different order. The most important thing is that teachers believe the organisation is representative of them. There is only one effective way to achieve that and that is to start with an organisation of teachers. Which teachers you say? Simple, elect them. But that will cost money, you say. So will re-inventing Wikipedia, but no-one seems to mind doing that. Take a short-cut. There are thousands of teacher governors who have already been elected by their peers. Use them as an electorate. Or some other method. Where there is a will, there will always be a way. Yes, people will have to stand for election (and consequently come with agendas) but that is the real world. Teachers are intelligent people. They can be trusted to pick a group of people to represent them. If you think they can’t why set the thing up in the first place? Once you have done this bit the rest of the process would stay much the same, except it would be the elected group in charge. Of everything. The first task would be to design a constitution for governance which could then be put for approval to all teachers. This should (in my view) be written in such a way as to guarantee the CoT is always governed by teachers. The main change I would make is a simple one. One that DfE would never countenance (which is why I know they are not serious about this whole process). Ownership of the teaching standards would pass immediately to the CoT. Without this, it is not a professional body for teachers. It’s an information exchange. This will both help guarantee the independence of the profession and act as a rationale for teachers to join the organisation. The CoT should be the body that confers QTS (and any other qualification relevant to working in a school*). The argument will be “Let the organisation settle in and then at some time in the future we’ll look at that possibility when we know it can handle it.” or some more patronising aggregation of words. Over the next few months we’ll hear a lot of soothing words about how we’ll get this right in the end and requests to “trust us on this” with regards to the governance arrangements. I don’t think that is appropriate. The governance of an organisation is a contract with the future. When I was taught contract law it was stressed that the time to get a contract right is when it is written. There is no later. As for trust, I’ll quote the only sensible thing Ronald Reagan ever said – “doveryai, no proveryai”. And, to show my truly cynical side, I’d add “cui bono”. More than anything else I want an effective, independent, teacher-led professional body for teachers. I want it to be of teachers, by teachers, for teaching. I want it to be able to protect the rights of teachers to teach and to provide the means for them to learn the myriad ways they can do that. It needs to listen to, respond to and represent its members. It needs to be listened to and to be heard. It needs substance, because it will need to speak truth to those who don’t want to listen. I’m fairly sure that this consultation won’t create that body. * Using the term school to encompass anything the membership of the CoT agrees. I’m definitely also a stickler for something that not only is practical but is also going to end up with a really representative body that we can look back on in generations and be proud of. I’m not sure I fully understand your point, so I may need to try and echo it back and see if I’m right. I was trying to suggest (if my rambling was intelligible) that a diverse and representative group of organisations would put forward a diversity of teachers, one from each. These teachers *explicitly* wouldn’t represent those organisations but would simply be a snapshot of the profession with a diversity of backgrounds, and would not be consulting with their ‘nominating’ organisations. This teacher selection panel then conduct an open application process from across the profession where anyone can put themselves forward to be a future trustee, and pick, again, a diverse range of practitioners followed by skills-based positions. This hopefully creates a functioning and representative trustee board which can create a sustainable and representative, well-functioning organisation. Your concern is that with this mechanism the influence of the original nominating organisations extends deeply, not only on to the selection panel, but right through to the trustees, and therefore all the way through to the set-up of the College, no matter who joins as a member. Therefore, you are saying, I think, the nominating organisations will be ‘running the show’. AmI understanding you right that you’re saying that ‘this makes it sound even more like it’s ‘an organisation-led body’ than when you thought in your original post that direct organisational representatives, ex-teachers and DfE appointees would be actually trustees. I guess I could have easily mis-understood that or that I’m just being dense, so I do need some clarification before I can revert? I hope what you can see is that we have tried to come up with something that can going in a timetable of months, that has been tested with a number of teachers and teacher professional associations/unions, and that seems to be something that can operationally be put in to play, and that can be democratic and representative. Fundamentally if the response from the majority is that this is a total no-no then of course it’ll be worth starting with a blank piece of paper and re-starting all the discussions with unions, associations, teachers, schools and possible funders. If the majority think this approach will work, then I hope we can keep moving. However, listening, humility and openness are vital from everyone involved at every stage. Your continuing questioning only helps to sharpen the debate and the thinking. You confirmation (via twitter) that the original organisation selected representatives cannot put themselves forward as Trustees is helpful. This provides a cut-out which goes some way to protect the body from any suggestion that it is a “creature” of those orgs. As I’m sure you realise, the actual make-up of this selection panel will be key to persuading potential members of the body that they would want to be involved. Any suggestion that it is not independent of the orgs will be unhelpful. Again, A list of who is involved in CYC would be helpful. Personally, I would separate out skills based roles from trustees. For example, whilst it will be helpful to have a trustee with an accounting background (which is not an application, btw), I would expect a body that would eventually have a multi-million pound income to recruit appropriate operational staff to such roles. I am concerned that the timetable is driven by political events, rather than by what is in the best interests of a College of Teaching. And I remain concerned that without control of the standards (or a promise of them contingent on meeting certain membership thresholds) then the body will offer little of interest to the majority of teachers. As I said in the original post – it needs substance. Huge number of massively important points which really chime with me here. I’m going to try and answer them, in a purely personal capacity, as someone who’s been enthusiastically stuck in to forming the Claim Your College campaign which is about facilitating teacher leadership and governance of any new College. For that reason alone, much of what you have said rings true. You hit the nail on the head in a number of ways, and what I’m hoping is that, in Claim Your College (henceforth CYC), we (and I mean we as I’d love you to get involved) can make sure that the issues you suggest are settled. Firstly then, on ownership. You’re right, para 2.5 nails it. It’s nice to know that the DfE does sometimes ‘get it’. You then go on to rightly point out that ‘teachers’ can’t be code for ‘not actually teachers but people who reckon they know what is good for them’. The proposals that I and colleagues have been discussing in CYC is that founding trustees are *at least* 50% drawn from an open application process of serving teachers and that these teacher trustees would have veto over anyone else who was elected for their skills (e.g. skill for running an organisation, skill around research, skill around legal/financial, etc). To protect that to yet another level, the selection committee should be mainly made up, I think, of a group of *teachers* put forward by organisations from across the education space (e.g. unions, schools, groups of schools, local authorities, universities). Hopefully that safeguards teacher involvement at multiple levels. You may well see ways to make this even better – yet more reason to get involved in CYC to influence it for the better. I certainly wouldn’t pretend we’ve got any monopoly on wisdom here! There have been some really good debates on twitter this evening as to the definition of ‘teacher’, which is very valid. I’d love for more people to get involved in CYC so we can get the best working definition of this as there will be different views. Next you talk about funding leading to de facto ownership. As far as I personally understand it, the current Coalition and the Labour Party are all in favour of a teacher-led College and providing no-string start-up funding. All conversations that I’ve been involved in about seeing how we can get teachers setting this up suggest that there is a clear determination that all funders are most welcome to donate start-up funding, but not at the cost of having strings – indeed I think the consultation makes clear that any funding would be no-strings and both this and any future government must be held to this at the point of any funding, and the same is true for any other funder. As we (the existing enthusiasts behind CYC) have put down in writing in our recent FAQ document (http://www.claimyourcollege.org/wp-content/uploads/2014/12/College-of-Teaching-QAs.pdf) we’re determined that all funding MUST be no-strings, and that if strings suddenly start appearing from any funder, we walk away from them. The last thing teachers need when they start leading this is a hangover of funding ‘strings’ that force their hand away from what they believe this College should be. On standards, I’d tend to agree that a College should eventually have a strong part to play in setting these, but if it’s truly voluntary then it will be hard for a sub-section of teachers to impose their will on all of the rest by setting standards for all. A tough question to be wrestled with by a future College – just one of many, I suspect. Lastly, on the CPD announcement. My reading of today’s consultation is that there are two completely separate strands. One is funding, through Teaching Schools, for CPD activity. The second, an open call to the profession, is for ways for government to support a College. I think some articles artificially conflated the two, and they are separate. As far as I know, the Teaching Schools Council have made very warm supportive noises about a new College, but they, like so many others, would be just one voice – it should still be representative of all schools, and all teachers. Finally, a mighty doffing of the cap from me to you on that last paragraph. It reflects, more eloquently that I could do, what I believe about what a new College must be. You’d be a real asset to the coalition to make this happen – I think you really get it. Please join us and Claim Your College. Firstly, thanks for taking the time to comment so fully. I think that on many of these issues we are in agreement, the need for a professional body being the most important. I think that there can be honest, open debate about the exact list of ‘capabilities’ of the body as these can be added to as it goes along (though I stand by my comments on the standards – without them any body is an empty shell). I interprete that to mean that there is a group selecting (drawing) teachers from applicants. My argument is that it is teachers who should be doing any drawing. In my opinion the whole process would be tainted if the initial group of teacher trustees were selected by anyone other than teachers. Any organisational structure should be subservient to this teacher body. If it wants to co-opt non-teachers then it should be able to. In essence, it is your suggestion turned around to put the teachers first. I understand the difficulties in doing this, and don’t underestimate them. I am just clear that not doing so risks the whole project. To risk an analogy, whoever does this has to be a midwife without touching the baby. On the idea that it will be difficult to have the standards if the body is voluntary and would be a sub-section of teachers imposing their standards on the whole, I would say that they are currently imposed by an even smaller sub-section, i.e. which group the SoS of the day can put together. Any such issue could be mitigated by ensuring that any consultation on changes to standards was not just restricted to members. If there are two strands then I would say that is further evidence of how this consultation/announcement (whatever it is then) has been a set back. If it is not a consultation on the College of Teacher(s/ing) then is the case there will be no such formal consultation, just an org appointed to run it by the Dfe then a call for members? If so, then the announcement today is just politicking. Politicians will, of course, be politicians, so it is not unexpected that they would use such a thing for their own purposes. It doesn’t however bode well for the holding of any commitments given. As for being an asset, thats debatable, but it would be good to be able to have a longer conversation about this at some point when we are in the same building. Hi Mike, I agree with you again. The ideas we (and by we I mean the enthusiasts who have been pushing the Claim Your College campaign so far) are refining about the make-up of a selection committee would mean that it was mainly made up of teachers, on each put forward by a diverse range of teacher-serving organisations. They then select teachers to be trustees from an open application process. There is a concern to ensure that the wider public feel this body is also representative so the thinking is to have minority representation from, for example, a governor, a teacher educator, wider employers etc – but where possible these would be current teachers too. So, the majority of the selection committee would, in our current thinking, be serving teachers, put forward from a diverse range of organisations – they would not be representing these organisations/institutions, they would be representing the wider diverse profession. Hopefully, if this balance is right, this locks serving teachers in to both the decision process and the actual governance. We’ve been running the idea by a large range of teachers and organisations and broadly people seem happy, but there’s always room to improve, of course. What do you think? n whether the DfE will ‘appoint’ someone to run this, I’m personally optimistic that this can’t/won’t be the case. We current enthusiasts of the Claim Your College campaign have been speaking to a number of other charities who, it seems, may be close to committing funding so that the very first part of the start-up phase may not even need DfE funding at all – that might be invited later. Fingers crossed. I rather like this symbolism, if it can be managed, that the profession went out to get funding, and government pitched in with a bit more no-strings funding later. My sense is that the DfE is, sensibly, paranoid about being the kiss of death to this idea if it looks like they’ve ‘appointed’ anyone, so I’m guessing they’ll be going to some lengths to avoid this appearance while tying themselves in knots to also claim (deserved) credit for offering no-strings support. As ever, I’d appreciate your further thoughts. You’re thinking very strategically and sharply about the issues here. I said it before and I’ll say it again, you’d be an asset to the Claim Your College campaign. On most things I am a fairly easy going sort of person. However, I am, I’m afraid, a fundamentalist when it comes to issues of governance and democracy. Unfortunately this is starting to sound more and more like an organisation-led body, not a teacher led one. A group of organisations selects a group of ‘mainly’ teachers to then select some trustees. In my view this would make the body representative of those organisations, not of the teaching profession. It may well be that those organisations would have no representation on the trust board but for me it taints the setting up of the body. Perhaps after many years when the body is fully democratically representative of its members then this might not matter. My point is that with the wrong start it may well not get to that point. There are better, more democratic ways to do this, which I would hope all involved would want. It may be, however, that such approaches don’t fit in with desired timetables – for example, the need to sign off any funding before 30 March 2015. And, to be honest, if the starting point is a body that is not democratically representative of the profession then I can understand the reluctance of the DfE to allow the body to do anything important, or indeed anything that is not already offered by a number of other bodies. What I take from the document published yesterday is that the DfE thinks the “…College of Teaching would be ideally placed to provide leadership of professional development…”. Well, that’s very nice, but as that is not a function currently reserved to any existing statutory body it’s not exactly giving away much. In terms of funding I am more sanguine about government seed funding than I would be with funding from existing organisations (who, whatever they may say, will have a dog in the fight). Government can walk away from such funding, as it so often does with much of the happy cash it throws around (another £5m this morning I see for yet another company in the careers space). I think I would generally feel more comfortable about the whole thing if this were conducted further into the daylight. I would like to see who is involved. Claim Your College represents itself as “being led by a group of like-minded individuals and organisations” without actually saying who they are. I think that the more people know then the easier it will be for them to decide if or how they want to get involved.